MTSU online master’s training ..
After receiving a scholarship toward her degree and career goals in foreign affairs, MTSU sophomore Hannah Solima of Smyrna, Tennessee, was even more convinced of the benefit’s of the University’s MT Engage curriculum program. “The outside classroom experience really does help with your education, and how you learn and overall growth as a person,” said Solima, a University Honors College triple major who’s had multiple study abroad experiences in pursuit of degrees in French, International Relations, and Criminal Justice with a Homeland Security concentration as well as a minor in German. 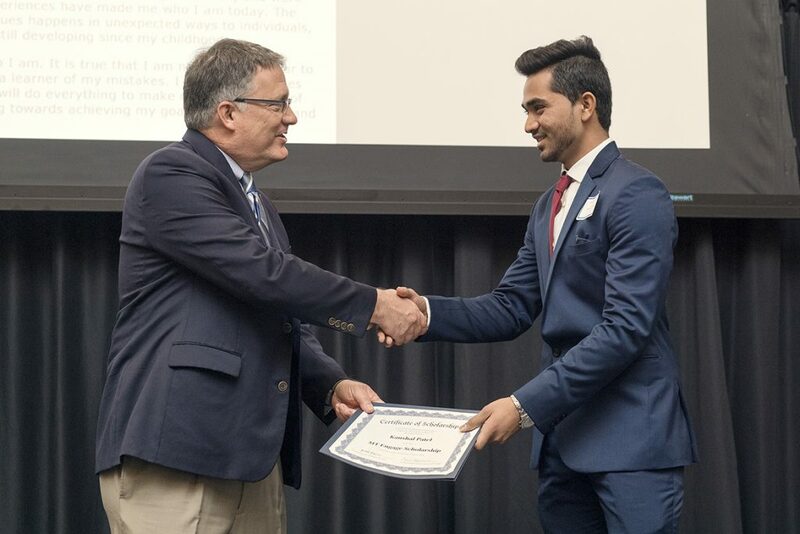 MT Engage, the university’s latest Quality Enhancement Plan now finishing its third year, announced Solima as the overall winner as well several other winners of its scholarships at the second annual spring reception held April 4 in the Student Union Ballroom. Scholarship applicants were required to create an e-Portfolio presentation to submit with their application. The e-Portfolio serves as an electronic record, created by students throughout their academic journey, that helps reflect on their learning experiences while also marketing them toward a career path or graduate degree. 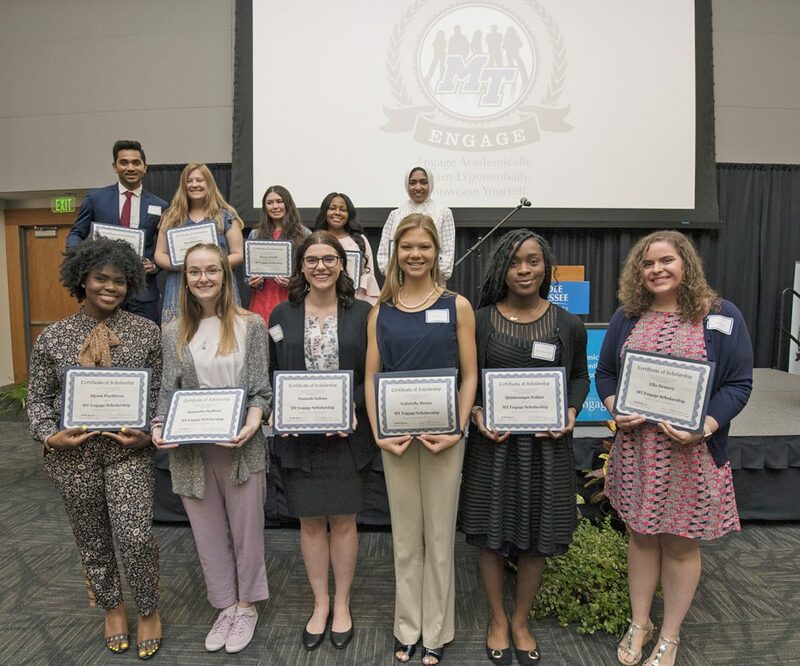 Launched in fall 2016, the goals of MT Engage include fostering a culture of engaged learning and integrative thinking, enhancing student satisfaction with that learning, and increasing student retention and graduation rates. Since the program started, it has attracted almost 21,000 students in MT Engage classes, with a current enrollment of close 9,400 students this academic year across 474 course sections. and Kaushal Patel and Quintonique Poitier from the Jones College of Business. To be eligible, scholarship winners had to have passed two or more MT Engage courses, attended an e-Portfolio training, have minimum GPA of 2.75, completed 60 hours of coursework and be current students in good academic standing. The scholarships are valued at $6,000 over four semesters. Also showcased at the reception were displays created by students in MTSU’s Reading History Initiative, a signature university program that links reading and U.S. history courses for incoming freshmen who need additional literacy skills. Becky McIntyre, associate research professor in the Department of History, coordinates the program. The Quality Enhancement Plan, or QEP, is a requirement by the Southern Association of Colleges and Schools Commission on Colleges, or SACSCOC, the regional accreditation body for higher education institutions in the South. MT Engage Director Mary Hoffschwelle applauded all of the students who participate in the program, which focuses on integrative learning. “We are so pleased with how MT Engage is progressing. The involvement of faculty and students has been outstanding, beyond our expectations,” Hoffschwelle said. 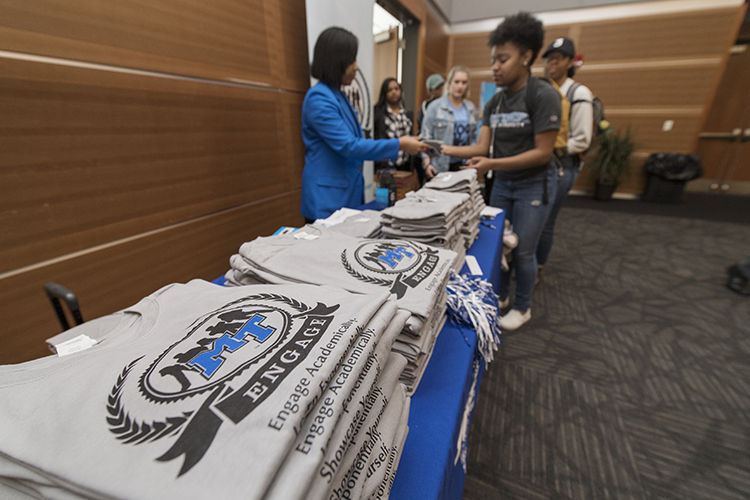 Students attending the reception received a free MT Engage T-shirt. 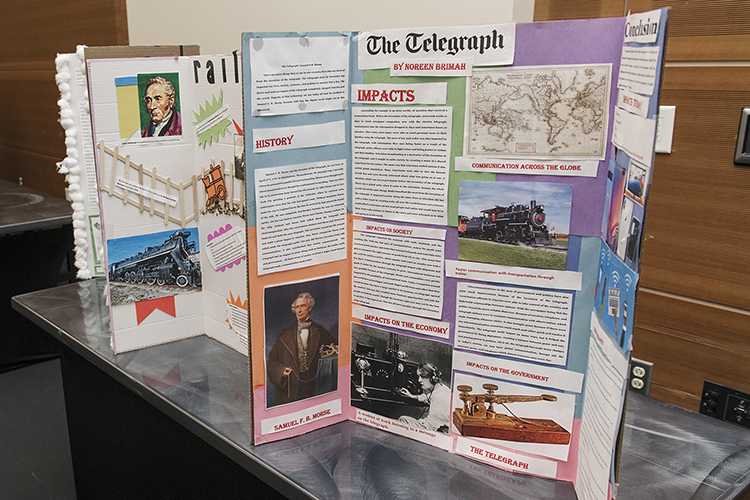 The event also featured displays from MT Engage students participating in the Reading History Initiative, an MTSU program that links reading and U.S. history courses for college freshman who require additional literacy skills. Featured speaker for the event was last year’s overall winner, Caroline Parker, a senior majoring in history with a double minor in English and Russian. Also addressing students at the reception were Hoffschwelle, Provost Mark Byrnes and Faye Johnson, assistant to the university provost for special initiatives. Academic college deans or representatives also attended. The MT Engage staff includes Hoffschwelle, Assistant Director Lexy Denton, and Assessment Coordinator Scott McDaniel. The office is located in the James Union Building, Room 306. Call 615-898-2761 or 615-904-8281 for more information or go to https://www.mtsu.edu/mtengage/index.php.